Just before we left Yountville we walked around a little to scout out the dining choices for our next trip. And there will be a next trip. We picked up a couple of pastries from Bouchon bakery, though we forgot about them and they eventually went stale in our car. Quel dommage. We left Yountville and drove along the less-busy Silverado trail, taking a quick detour up Howell Mountain to kill some time. We didn’t stop at any wineries, but did see some nice views. 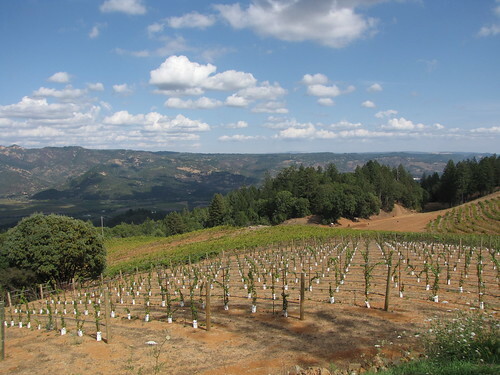 We then drove down a crazy winding narrow barely-paved road (kind of like driving to Rocamadour but without the sheer cliffs) to the main road again, and entered St. Helena. There’s not much to the town of St. Helena but the main street, and a nice one it is. We parked the car and went in search of a place to eat. Once again, our book saved the day as it recommended a place called Cook. Turns out, it’s the place all the locals go to for a good meal…score! My BLT was awesome, and I don’t even like BLTs. Nellie’s gnocchi in marinara was excellent as well, as was her Chardonnay (I didn’t drink at lunch…I might have been sporting a tiny headache after the previous night) and our dessert — apple crisp with vanilla gelato — sent us on our way with a smile. Now it was time to start with some tastings, so we headed up Spring Mountain road. 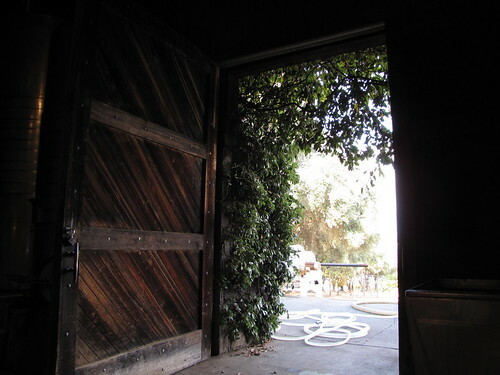 Said road is long and winding indeed, and it took us a while to find our first stop: Robert Keenan Winery. A dog ran out to greet us — a dog who is, we discovered, featured in the book Winery Dogs of Napa — and lead us into the tasting room. There we met several other patrons (including another Canadian, natch) and Laura, the hostess, who poured us several wines. Our favourite was a Cab Franc, which we bought, and and we began the long journey back to the main road. Not bad, right? We sat there for a few minutes, soaking it all in (including the very tasty chard) before heading back down. By this time the others had arrived, including a guy with his harem of hot women, and the tour started. Well…not a tour so much as a spoken-word art piece by Mr. Smith with some live demonstrations built in. Very educational too. He was just a great old guy, and we spent over an hour with him. We’d have stayed another hour if thought he didn’t have to get back out and tend to the grapes. We left with a bottle of their Riesling, which was entirely unlike anything we’d had in Ontario. Entirely happy with our tastings we drove back down to the main highway and drove north to Calistoga. We found our B&B, the Chanric Inn, and checked in. Zoinks, this place was nice. The hosts (and their dog Dinnigan!) were great too. We dropped our crap, hit the pool for a rather chilly swim, drank the Smith-Madrone Riesling, chatted with the other guests and got ready for dinner. Regrettably, dinner was pretty disappointing. We wanted to pair something with the Keenan Cab Franc we’d bought, and fell for the first piece of red meat we saw. We went to a grill that I think we knew we shouldn’t have. Our soup was okay. Our glasses of white were shite. Our mains (my ribs, Nellie’s “filet mignon”) left a lot to be desired. The best we could say about this place was that corkage was free. Happily, the meal didn’t last long because, after we walked back the room, we fell asleep on the bed like little kids. Thank you, Dan, for a great snapshot of life at Smith-Madrone. Charlie & Stu will work on their Richard Attenborough imitations..!!! Could you please email me offline (I have a quick question)? Come back anytime!! !